Annie is famous! I submitted her picture for this very cute blog feature, Monday's Pets on Furniture at Desire to Inspire. This is Annie's picture under our new picture! We're getting closer. 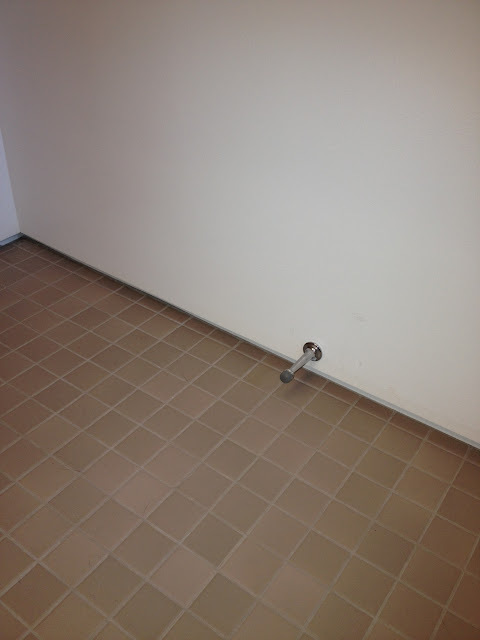 Tile is up in the third bathroom, and it is the "surprise" darker tile. You like? What no baseboards!??! And no crown molding? They may kick us out of Corona del Mar. Had I examined our plans more closely, I wouldn't have been as surprised when the contractor announced the first two bathrooms were done. I immediately emailed him my list of little things to take care of. Like, where are the baseboards? Do you see a baseboard? I sure don't. Three and a half months, and finally, the third bathroom is in progress! You probably already have the general idea from the other two previous bathrooms, but this one will be a little different. This bathroom is, by far, the biggest bathroom of the three, and the widest. Therefore it will have a tub, and a darker "tile feature wall." Tile in the guest bathroom will be the middle right. Alex's and master was the top right. Albert and Alex took my Canon EOS Rebel off to Gibraltar for Spring Break, including the fabulous wide angle lens that has been providing all the excellent pictures of the tiny bathroom spaces. Gibraltar is a really unique place, I have visited once. It is a one mile wide by five mile long British Colony off the coast of Spain, at the entrance to the Mediterranean. Gibraltar's population hovers around 30,000 and is an interesting mix of Spaniards, Moors, British and Jews. It was a safe-harbor destination from Spain's fascist leaders, back in the day. Albert's mum and dad are from Gibraltar, and Albert was born there during a brief interlude when the parents thought they might move themselves and their four, then five kids back to Gibraltar from the states. Albert texted me a few pictures from his camera. on Albert's camera, sorry for the quality. Rock is on the right. Doors are so important to the shower experience and I am happy to report we have beautiful, stunning, extra clear glass, half-inch thick shower doors. Of course they are frameless with a plain chrome handle. They swing both in and out. We also got the bathrooms painted in Benjamin Moore Super White. No kidding. I thought it would be blinding but I kind of dig it. Alex's bathroom; see the shower door and the blinding white paint?